Nav System, Heated Seats, iPod/MP3 Input, Satellite Radio, Keyless Start, Onboard Communications System. EPA 30 MPG Hwy/21 MPG City! 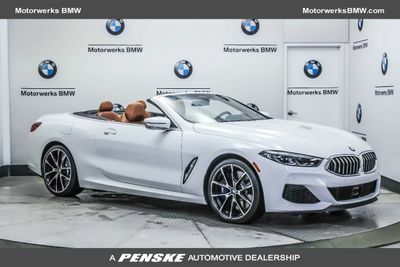 Mineral Grey Metallic exterior and Coral Red Dakota Leather interior, M240i xDrive trim READ MORE! Back-Up Camera, Satellite Radio, iPod/MP3 Input, Onboard Communications System, Keyless Start Keyless Entry, Steering Wheel Controls, Rollover Protection System, Electronic Stability Control, Heated Mirrors. PREMIUM PACKAGE Heated Front Seats, Universal Garage-Door Opener, Navigation System, Speed Limit Info, Remote Services, Advanced Real-Time Traffic Information, Apple CarPlay Compatibility, 1 year trial, Heated Steering Wheel, harman/kardon PREMIUM SOUND SYSTEM, ADAPTIVE FULL LED LIGHTS: Automatic High Beams, PARKING ASSISTANT, WHEELS: 18" X 7.5" M JET BLACK (STYLE 719M): Double-spoke, ALUMINUM HEXAGON TRIM W/HIGH GLOSS BLACK HIGHLIGHT. BMW M240i xDrive with Mineral Grey Metallic exterior and Coral Red Dakota Leather interior features a Straight 6 Cylinder Engine with 335 HP at 5500 RPM*.